Short or compact keyboards are a simple workstation change which make computer use safer, more comfortable and efficient. There is now a wide range of compact keyboards to select from with many features and options. Most models have full sized keys so feel like a normal keyboard. There is no numeric keypad but cursor control and other keys are still present. 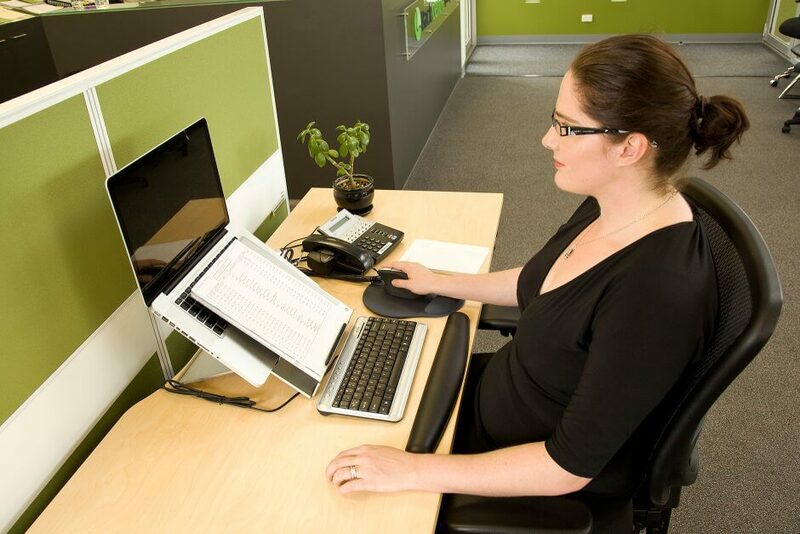 A compact keyboard is probably the most effective workstation change for people who experience right sided pain in their arm, shouler or neck. Changing to a compact keyboard will often result in improvements in these problems. Eliminating the numeric keypad saves desk space and allows the mouse to be much closer to the body. When the mouse is closer the arm does not reach out as much. The arm is more relaxed, feels lighter and the shoulder and neck muscles are more relaxed. Having the mouse closer means more speed. Even though the change in distance is not great, we reach for the mouse 1,000’s of times a day so a closer mouse and less shorter distance adds up. Being small and light makes a compact keyboard great with a laptop or when travelling. Many compact keyboards have short cut keys for quick access to internet, multi-media and frequent mouse commands (save, print, copy, paste etc). Some compact keyboards have curved or angled rows, which encourages better, more relaxed wrist and arm postures. Unfortunately, this does not really apply to those who are 2 or 4 finger typists. Though we love compact keyboards, they are not great for people whose job requires frequent entering of numbers because there is no separate numeric keypad (number keys are only across the top row). The solution? Some compact keyboards have an ‘integrated’ or ’embedded’ numeric keypad, assessable via number lock. There are also compact keyboards with separate numeric keypads, which can be placed on the left side of the keyboard. Back Centre stocks only compact keyboards with normal size keys: watch out for compact keyboards with smaller keys. These are not ideal for larger fingers. Back Centre is happy for you to trial a compact keyboard to find out if it is a good solution for you. View Back Centre’s huge range of keyboards.